Objecting to the government’s proposal of implementing 27 per cent reservation for OBCs, two members of the National Knowledge Commission, Pratap Bhanu Mehta and Andre Beteille, today sent in their resignations to the Prime Minister. Media reports about the Income Tax Department out to levy maximum taxes on the broking community sent the bourses on a wild swing today. Even as security forces are on a high alert ahead of the roundtable conference, at least 23 persons, including four police and four security personnel, were injured in three grenade explosions here today. The moderate faction of the Hurriyat Conference here today announced its “unanimous” decision not to attend the two-day second roundtable conference to be presided over by the Prime Minister, Dr Manmohan Singh, here from Wednesday. Leaders of Pakistan Occupied Kashmir, who are here for the first time after participating in a seminar, have sought to turn the spotlight on Gilgit-Baltistan (GB) region, and blamed both India and Pakistan for the continued neglect of the region. Accused officer legal adviser in own case? 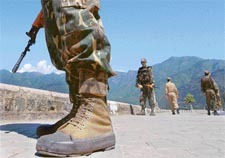 The Army has convened a court of inquiry (CoI) into the alleged molestation of a lady officer by her superior officer at Headquarters, 16 Corps, in Nagrota. The CoI, ordered by the General Officer Commanding, 16 Corps, is being headed by Brig S.B.S Choudhary, Deputy Director, Ordnance Services, 16 Corps, and includes a Colonel and a Lieutenant Colonel as members. The UPA government found itself on the back foot today when the Samajwadi Party, along with Opposition benches, said corruption, price rise and suicides by farmers were the major “achievements” of the government in two years. A Hoshiarpur-based woman, whose US-based husband had divorced her by allegedly misleading a US court, has successfully convinced the US court to reopen the divorce case as she was kept in the dark by her husband about the proceedings. 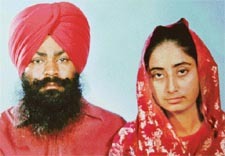 A file photo of Ms Dalvir Kaur and her US-based husband.